Submitted by mahoney on Wed, 03/05/2008 - 9:55am. 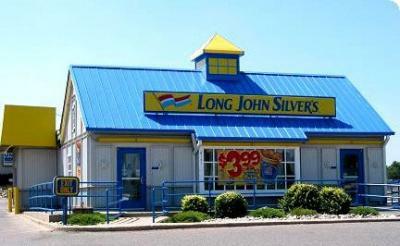 Long John Silver's Restaurants across the USA...The restaurant, which has over 1100 units worldwide, is a division of Yum! Brands, Inc. The company purchased it from Yorkshire Global Restaurants, which originally acquired it from Fleet Boston Bank after its having gained control of the restaurants due to bankruptcy. Yum! originally combined many of the franchises' locations with its chain of A&W Restaurants; most Long John Silver's locations that have opened in recent years are co-branded Long John Silver's/A&W restaurants. YUM announced in 2005 that it would expand the multi-brand concept and pair Long John Silver's with KFC, just as they had paired Taco Bell and Pizza Hut along with A&W. The parent corporation of the chain's Canadian franchises, which have no connection with A&W in Canada, is Priszm Brandz. The first restaurant was opened in 1969 in Lexington, Kentucky. Updated the file. Net decrease of 192 locations. Submitted a closed location in Portage,MI. Corrected the address for a location in Jackson,Tn. Added a location in Eustis,FL and deleted the locaation in Merritt Island,FL. The location in Merritt Island,FL is closed for renovation. Complete update using latest data from the LJS website. Corrected coordinates on 2 locations. Corrected coordinates on Butler-106 Moraine Pointe Plz-PA location. There are currently 7 users and 18 guests online.